Apple kicked off its annual Worldwide Developers Conference on Monday with a keynote showcasing a barrage of new products including macOS High Sierra and iOS 11 on the software side as well as new Mac hardware, the company’s long-rumored home speaker (dubbed HomePod) and a new tablet. 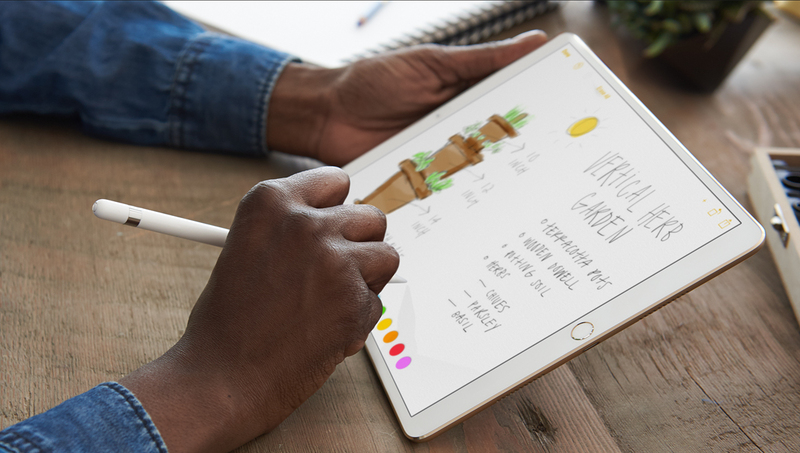 Apple’s stable of iPads, which already includes models with displays measuring 7.9 inches, 9.7 inches and 12.9 inches, now includes the all-new 10.5-inch iPad Pro (to clarify, the new 10.5-inch iPad Pro is replacing the 9.7-inch iPad Pro). The 10.5-inch “Retina” display offers a resolution of 2,224 x 1,668 (264 PPI) with 20 percent more real estate than the 9.7-inch variant. By reducing the bezels by nearly 40 percent, Apple was able maintain a slim profile that’s only marginally bigger than the 9.7-incher (while still weighing just one pound). The extra space allows for a full-size on-screen keyboard or a full-size Smart Keyboard, if you prefer something physical. The display is also brighter than before at 600 nits and features Apple’s True Tone technology. What’s more, Apple’s new ProMotion technology enables refresh rates of up to 120Hz for an incredibly smooth graphical experience. Powering the new iPad (and the refreshed 12.9-inch iPad Pro) is a six-core A10X Fusion processor with embedded M10 coprocessor and a 12-core GPU. Apple says the new iPads offer 30 percent faster CPU performance and 40 percent faster graphics performance versus the A9 chip. Battery life continues to be rated at up to 10 hours per charge. Around back, the iPad Pro gets a new camera (a camera on a tablet – pointless, I know). It’s the same 12-megapixel sensor found in the iPhone 7 complete with f/1.8 aperture lens, optical image stabilization and quad-LED True Tone flash. Similarly, the new front-facing FaceTime HD camera is also from the current generation iPhone. It’s a 7-megapixel sensor with 1080p video recording capabilities, auto-HDR and Retina Flash. The new 10.5-inch iPad Pro starts at $649 for a 64GB Wi-Fi only model and tops out at $1,079 for a 512GB variant with cellular connectivity. Apple is accepting pre-orders from today with plans to begin shipping next week.